Inspired by virtuoso violinists of the past, Signor Paganini is the ultimate Solo Violin spiccato/staccato library. Designed by an Emmy Award-Winning team, Signor Paganini defines a new level of realism in virtual solo string instruments. 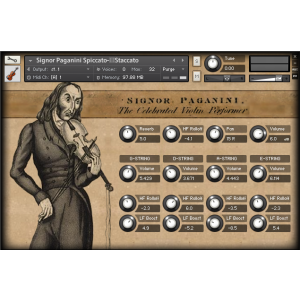 Ideal for film and classical applications, Signor Paganini is the only virtual solo violin that can convincingly execute extremely fast playing with ease, utilizing 13 velocity layers. Unlike any other virtual solo string instrument, the Kontakt interface allows users to apply EQ controls to each individual string, creating unsurpassed abilities for tonal and timbral shaping. Designed for the full version of Kontakt 5 or 4 and above (Download Only). Inspired by virtuoso violinists of the past, Signor Paganini is the ultimate Solo Violin spiccato/staccato library. Designed by Emmy Award-Winning composer, Garth Neustadter, Signor Paganini defines a new level of realism in virtual solo string instruments. 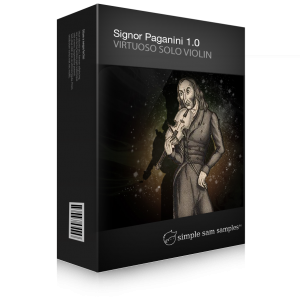 Signor Paganini is the only virtual solo violin that can convincingly execute extremely fast playing with ease, utilizing 13 velocity layers. Unlike any other virtual solo string instrument, the Kontakt interface allows users to apply EQ controls to each individual string, creating unsurpassed abilities for tonal and timbral shaping. Ideal for film and classical applications, Signor Paganini Solo Violin was patterned after one of the most famous Stradivari violins created: the 1727 "Paganini" Strad. Virtuoso violinist, Nicolò Paganini, purchased the instrument in 1817 for a mere $128. The instrument is now worth over 5 million dollars! Possessing a brilliant and strong tone accurately emulated by the virtual instrument, Paganini himself declared, "This violin has a tone as big as a double bass; never will I part with it as long as I live." He never did. Featuring an extended sampled range almost an octave beyond similar solo violin sample libraries, the designers of Signor Paganini sought to retain many of the subtle nuances and "auditory cues" that define the performance of a great virtuoso violinist, from subtle attack sounds to natural releases. Version 1.0 includes a single patch that focuses exclusively on spiccato, staccato, and ricochet articulations. Unlike other libraries, Signor Paganini truly captures the full dynamic range of a solo violin performances, from light sautillé bowings to heavy spiccato attacks, with 13 velocity layers. Customers who purchase Version 1.0 will receive free future updates to the short articulation patch. Note that Signor Paganini 1.0 contains one performance articulation patch and no round-robins. Users must have the full version of Kontakt 5 or 4 and above. This product is not compatible with the free version of Kontakt. Click here to view the Full Product Manual. This library is designed for the full retail version of Kontakt 5 (5.0.4+) or Kontakt 4 (4.0.5+) and includeds 1 Kontakt 5-compatible nki program and 1 Kontakt 4-compatible nki program, featuring custom front panel controls. Native Instruments Kontakt version 5 or 4 full retail version is required to use the .nki instrument program presets included in this library. The free Kontakt “Player”does not support this library. The Kontakt Player can only load standard open-format products like this one in a 15-minute locked “Demo Mode”. Upgrade to the full version of Kontakt to remove that limitation. Also be aware that the “Libraries” view tab does not support open format libraries. You can use the Files, Database or Quick-Load areas to browse and load this type of library. Windows XP / Vista / 7. Intelmac and Mac OS 10.5 or higher. Dual Core PCU, 2 GB System Ram, 7200 RPM 8MB Buffer SATA II hard drive recommended.